Your home may be the most important place on Earth to you. It helps to keep you and your family safe and comfortable, and it gives you a great place to relax and enjoy life. You do all that you can to keep the inside and outside of your home looking its best all of the time, including taking care of your lawn, garden, flowers and trees. However, there may come a time where the safety of your home or property is threatened by the trees on your property because of overgrowth, damage, or pests. It is a good idea for you to take a good look at your property and seek a professional eye from us at Your Way Tree Service Inc. so you can determine if you need tree removal in Calabasas. It is not uncommon for things to happen to your trees over the time you own your home. There are going to be occasions where serious storms occur with high winds, hail or heavy rain. Any of these conditions can cause significant damage to a tree, taking down roots, shearing off parts or even uprooting the tree. A tree that has suffered significant damage like this poses a threat to your property and should be removed safely. Trees that experience disease or infestation often need removal as well. While we can take some measures to help improve the health of a tree, there are some diseases that cannot be treated and you are better off removing the tree, so it does not cause damage to your property or spread its disease to other trees in the area. There may also be times where you are considering a renovation project of your home or landscape. You may seek to put an addition on your home or plan to do something with a particular space of yard where a tree currently resides. 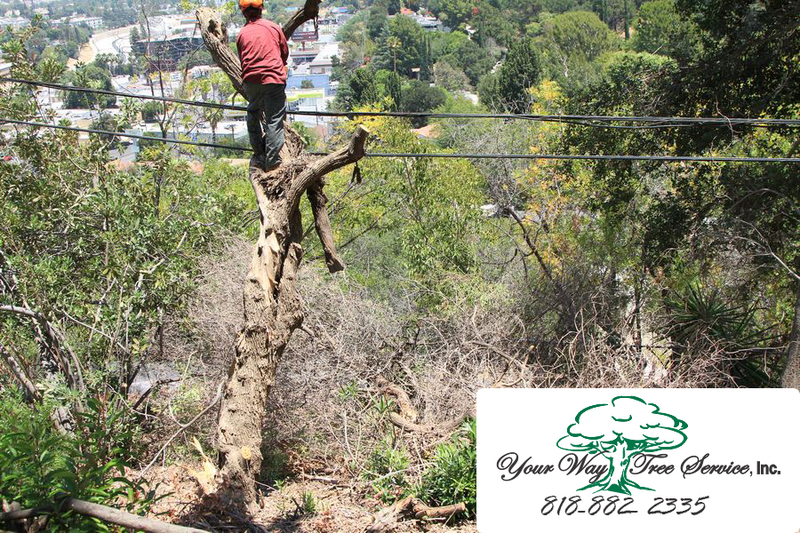 When you use our services at Your Way Tree Service Inc., we can provide you with tree removal in Calabasas so that we can safely remove the tree or trees in question. We can even help you plant new trees in other locations to make up for the ones you removed. The best way to know if you need tree removal in Calabasas is to call us at Your Way Tree Service Inc. to arrange for an evaluation. You cancall our office at 818-882-2335 to schedule an appointment for one of our experts to come to your home and evaluate your trees and discuss what you want to do. We can safely help you with tree removal so that the job is done correctly and leaves your property the way you want it.